This simple craft makes an ideal Christmas gift. It isn't expensive to make, doesn't take long and really is very easy! You will need to save up any containers that are cylinder shape like cocoa pots, pringle packets, coffee jars etc. They need to have a lid and should be cleaned before you use them. You could use any cookie recipe but I always follow this one which makes the yummiest cookies ever. Beat the butter and sugar together until light and creamy, then beat in the syrup. Work in half the flour. Stir in the smarties with the remaining flour and work the dough together with your fingers. Divide into 14 balls, place them well apart on a baking tray and cook for 12 minutes until golden at the edges. As soon as the cookies are out of the oven you will need cylinder container you will use later. 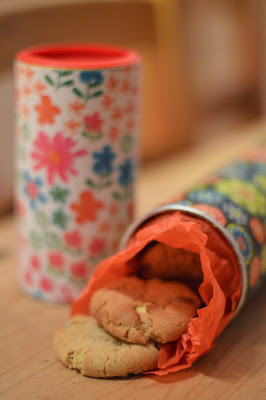 Cover each cookie with the cylinder (see photo) and move it around the cookie in circles. This will shape the cookies slightly smaller than the container so they fit inside once cooled. Now you are ready to decorate the container. Find some beautiful wrapping paper - You will probably notice this is paper left over from last week's craft! 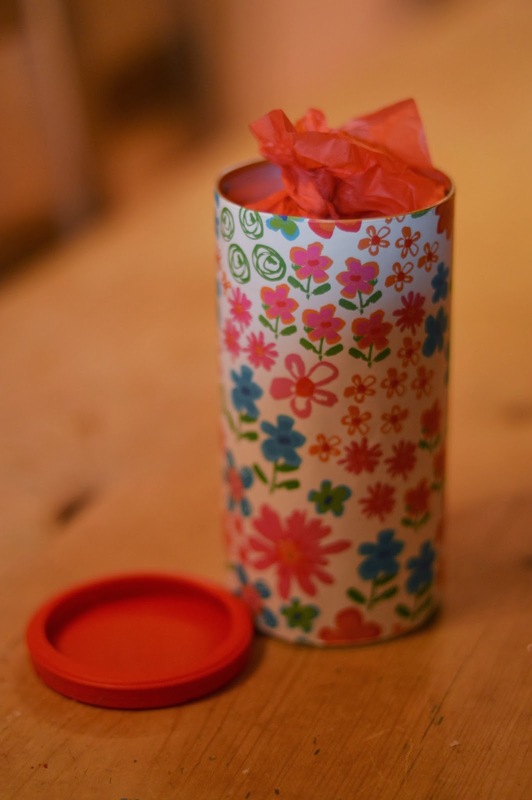 Cut it to the right size to cover your cylinder, glue it and stick it to decorate your container. Already it looks pretty, so by wrapping up a tower of cooled biscuits in some brightly coloured tissue paper we are only adding to the deliciousness! 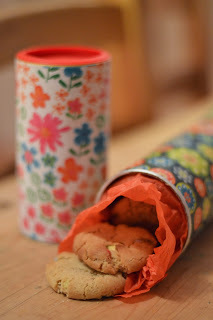 I love giving home-made gifts to friends and family, and this is such a simple and tasty gift to delight any recipient.